Installed the MAS version today and everything seems to be working well. Nice update Russell. My take on all this is people are fairly patient as long as you acknowledge the problem and are working on it, like you communicated here over the last weeks. Nicely handled. Ive just uploaded v4.5.2 to my site, and requested an expedited review for the Mac App Store. Yeah... I'm seeing the same crash on app store 4.5.2. On the plus side though, it no longer corrupts the cookies database. You can restore the BinaryCookies file, but you also need to restart the nsurlstoraged process for any changes to be effective. Thanks for the tip. That is the piece I was missing. but v4.5.1 has been uploaded for review and restores full full functionality to Cookie. It will be available in around a week i guess. Thanks for the update Russell. Can you comment on my question about restoring cookies from backup under El Capitan. It seems to be prohibited by some unknown process (like cookiesd did in Yosemite). I have a different issue. When I upgraded to El Capitan, all continues to work as had in the past as far as saving the cookies I wanted. Since I recently upgraded Cookie, I now need to re-login to most every site. It is not keeping the cookies in Safari it seems as it doesn't remember I was logged in just minutes ago. Any thoughts on troubleshooting steps that should be done? After more usage today, I am seeing the same thing. What is odd though is from looking at Cookie it does not appear the actual cookies for the sites are being removed, so I don't understand why this is happening. With the earlier El Capitan bug, the cookies were getting corrupted and removed, so having to reenter the login was expected. But now the cookies are still there, yet I still have to login again. Related question for Russell... this would all be less annoying if I could just restore my cookies from backup. I see where the binary file is in ~/Library/Cookies but a restore does not appear to work. I see web info talking about shutting down cookied to allow a cookie file restore in Yosemite, but El Capitan does not appear to have that process. 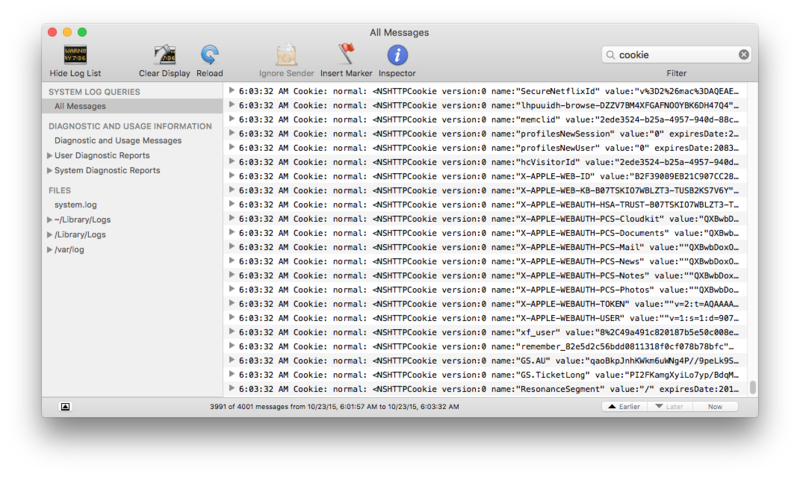 Have you found a way to restore the Cookies.binarycookies file in El Capitan? Cookie 4.5 working well for me also in El Capitan. Thanks for the update. I do see an issue in Console log though. Every time Cookie refreshes itself (every few seconds) it fills the log with a couple hundred new entries. Just in the last few minutes I have stacked up thousands of these entires completely pushing out any other normal log entries. You can see a screenshot below.